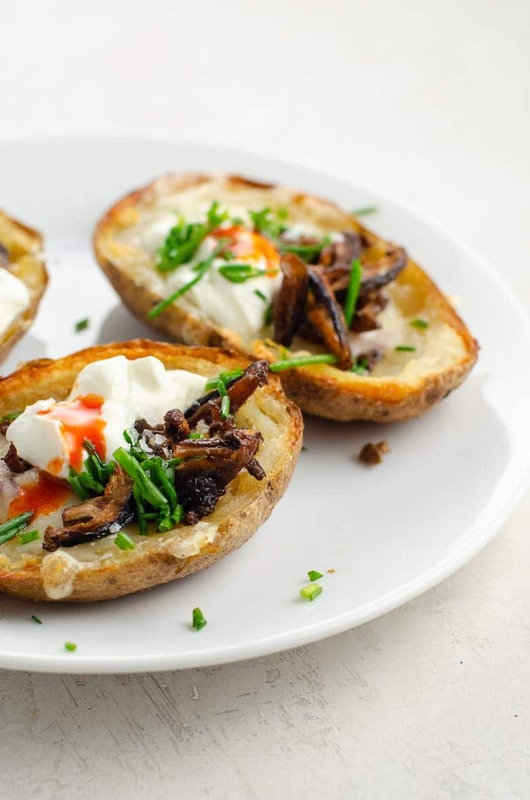 Potato skins are such classic game day food that they hardly need an introduction. They're inexpensive to make, hearty, and great for a crowd. And just like jalapeño poppers, the baked version is truly at least as good as the fried version, and makes so much more sense both nutritionally and logistically. 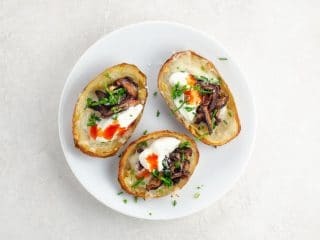 If you bake the potatoes and cook the bacon (or shiitake bacon) ahead of time, perfect potato skins can be ready in scarcely more than 30 minutes. 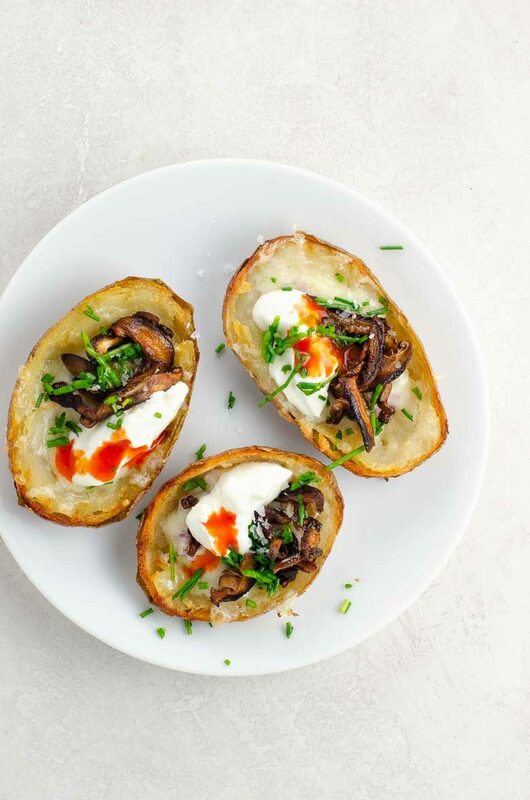 Make our potato skins recipe classic with bacon, or vegetarian and truly just as savory with our popular shiitake bacon bits. Small russet potatoes (also called Idaho potatoes) work great for potato skins because they crisp nicely and tend to have a wide, flat side. Use small russet potatoes (also called Idaho potatoes) for their crispy skins, tender, fluffy flesh, and great shape for filling. Start with our perfect baked potatoes. Use really good butter. 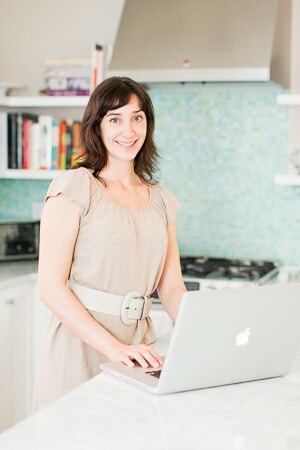 We love Kerrygold salted butter for its combination of great taste (it's cultured and made with milk from grass-fed cows) and reasonable price. 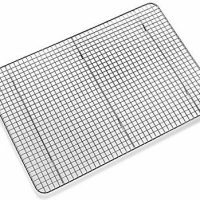 The wire rack really makes a difference in helping to crisp the potatoes, and it's a great investment for lots of other crispy baked recipes and for cooling baked goods, too. Get creative with toppings if you like! Right off the top of our heads, we're thinking French onion soup potato skins with caramelized onions and Gruyère cheese and nacho potato skins with pepper jack cheese, guac, sour cream, and sliced black olives. Go classic, go nuts, or go home. Potato skins need no introduction as classic, essential tailgate food. Our version is savory and craveworthy and also comes with a vegetarian option, swapping in our popular vegan bacon bits (shiitake bacon) for the usual crumbled bacon. We absolutely adore both versions and promise you won't miss the meat if you go veg. Preheat oven to 450°F with a rack in the center. 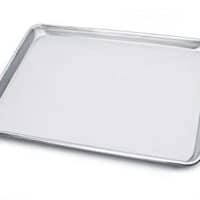 Place a baking rack on a rimmed half-sheet pan. Cut each baked potato in half lengthwise. If there's a side that's flatter (which is often true for russet potatoes), cut so that the flatter sides will be on the bottom and the cut potatoes will be wide, shallow, and stable. Brush tops and bottoms of potato halves with melted butter and sprinkle with fine sea salt. Place potato halves skin-side up on baking rack. Bake for 20 minutes. Skins will be crisp and lightly browned and flesh will be very tender on the inside. Flip potato halves right-side up and sprinkle some minced shallot into each. Top with cheddar. Return potatoes to oven for 5 minutes or so, until cheese is melted. 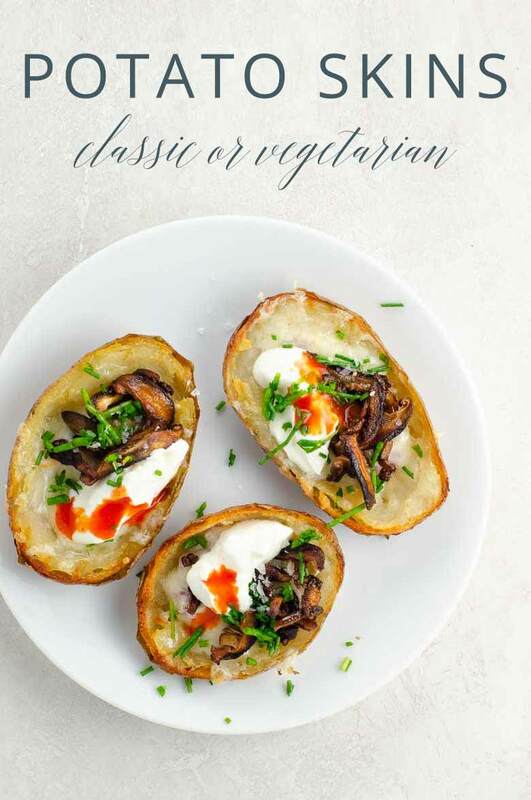 Top each potato skin with a dollop of sour cream, about a tablespoon of crumbled bacon OR shiitake bacon bits, some minced chives, a shot of hot sauce, and a bit of flaky sea salt.